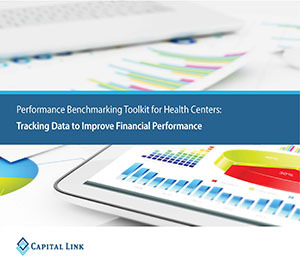 Capital Link announces the release of Performance Benchmarking Toolkit for Health Centers, a new resource to help health centers access and interpret key metrics and compare their performance to their peers. As health care reform implementation proceeds, health centers increasingly need to demonstrate value and identify strategies for operational improvement. This toolkit provides analytic tools so health centers can measure and monitor data to inform decision making that targets financial sustainability and continued success. Access a free download at www.caplink.org/resources/publications with registration to our website. This toolkit was developed with support from the Health Resources and Services Administration (HRSA).